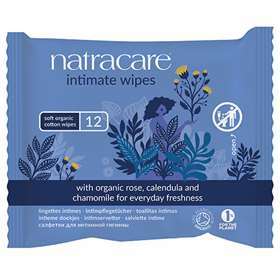 Natracare intimate wipes are organic cotton and have a pleasant fragrance of Organic Rose, Calendula & Chamomile. Natracare intimate wipes are made from organic cotton so are soft, strong and are gentle on your skin. Organic Cotton wipes Aqua, Glycerin,Rosa gallica (rose) flower extract (organic rose extract), Rosa damascena (rose) flower oil ( organic rose oil), Chamomile recutita (matricaria) flower extract (organic chamomile), Calendula officinalis flower etract (organic calendula), Sodium chloride, Polyglyceryl-10-laurate, levulinic acid, Sodium levulinate, Potassium sorbate, Sodium phytate, Maltodextrin, Citric acid, Sodium benzoate.